critically acclaimed double-cd debut Well of Souls. textures that defy any sense of known location or origin. The release gathers four stirring pieces which lead to a final harmonic reflection which suggests what’s in store on their next project, already in the works. Cavern of Sirens encompasses nearly 74 minutes of music presented in an elegant booklet featuring the organic visions of Belgian photographer Martine Verhoeven. soundcurrents spiraling ever deeper through the Cavern of Sirens. The best music often comes from deep within an individual’s soul, and whether a composer uses his or her creations to release personal demons or express unbridled joy, the resulting tunes work because audiences have more often than not experienced similar sentiments. 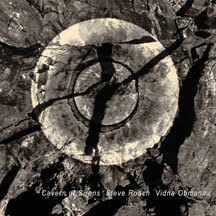 Steve Roach, a pioneer in the ambient realm, and Vidna Obmana, a well-respected Belgian artist who is a more recent entrant into the space-music arena, join together on this disc to masterfully meld their collective emotions and take listeners on a dark yet decidedly delicious journey. This five-track tribal-trance album is a follow-up to an earlier collaboration titled WELL OF SOULS, and the softly subterranean nuances of that initial CD remain strongly evident on this package. The 73-minute trek commences with “Ascension for Protection,” an ephemeral work that smolders with an intoxicating mixture of synthesized effects, ethnic chanting, and a series of reverberant noises emanating from implements like didgeridoos, shells, and rainsticks. The compositions that follow twist and turn through gorgeous grottos of electronic and organic sound before ultimately reaching “The Graceful Sky,” an unambiguously ambient piece that concludes the aural adventure with a stately sense of revitalization and restoration. Through CAVERN OF SIRENS, one becomes thoroughly engulfed in the emotional and acoustical world of the artists. The excursion is hauntingly beautiful.